What was billed to be the most exciting match of the year, lived up to the hype. 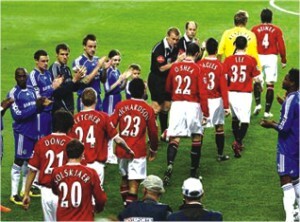 Manchester United's supremacy was matched against Chelsea's tenacity, on the day of the champions. It was an equally matched battle for most of the game, with both teams creating plenty of chances, Chelsea of course looking far more superior at times. Many would say that Chelsea had a better team on field and on paper, but then again people say wrong things. Cristiano silenced his very few critics by scoring the opening goal, proving that he could perform in the highest stage of them all, with an almost visible sense of smell. The lead was not much long lasting as Chelsea equalized within 20 minutes with perhaps one of the luckiest champions league goals. Micheal Essien's through ball took two deflections before dropping onto Frank Lampard's legs, which he guided in the back of the net, just as Edwin Van Der Saar slipped, diving in helplessly. The second half was when Chelsea got on the field with steeled nerves, attacking with a vengeance. But Manchester United were not to be over-taken and they also created some sleek chances, mostly on the back of Tevez's presence everywhere on the field. Didier Drogba failed to come alive again along with Wayne Rooney, both looking tired. Makalele provided a solid road-block allowing Chelsea to dominate the mid-field through Ballack and Lampard. Earlier in the game, Makalele was booked for absolutely nothing except that Scholes was much too old for this game, much too frail, bleeding at the first chance he got. The referee did make a lot of dubious decisions, most of them going Manchester United's way. Fracas started after Tevez had opted to choke Ashley Cole during a dead ball situation and then as Cole fell, Tevez decided to send the ball out for a throw-in, instead of the more fair, goal kick. Surrounded by players in the blue shirt, Tevez argued his case and Vidic may have mouthed off a bit too much, as he got slapped by Drogba. Of course Drogba was a proud man in blue and stood his ground after the slap, instead of collapsing, something Nani would have surely done. But a red card was shown anyway and Drogba walked back and soon it was extra time and Chelsea created chances and Terry became hero by saving a shot by Giggs at the open net. Penalties came about and many wondered why Avram Grant had send in Anelka instead of the more proficient penalty-kick taker, Shevchenko. Sure Sheva had missed a penalty during AC Milan's epic loss against Liverpool, but Frank Lampard too had missed penalties. Everything went well and Ronaldo took the spot, tried an over-used trick and failed to score. But that was pardoned as Terry slipped on his turn, handing Manchester United a lifeline. It really came down to the wire, and Chelsea fans witnessed the lack of confidence Avram Grant had, as Anelka came to take the kick, looking like something the cat had dragged in. Clearly, he had no interest in this match and thus his lackluster shot was saved, handing Manchester United a win which they deserved. Of course Chelsea fans can take comfort rueing missed chances, but United had many chances as well. Next year is something we can all look forward to.